A classic hat in Kazakhstan is considered normal skullcap, dubbed “takiya”. It can be worn by people of all ages and social ranks. The most common skullcap worn over the head. If desired, it can be covered with the help of other hats. Today, the younger generation opts skullcaps entitled “zer takiya”. Decorated with gold thread a headdress made of silver or gold. 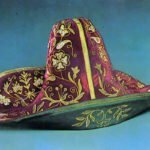 People of advanced age have chosen dim caps, which are used in the manufacture of the thin lining of the coat. 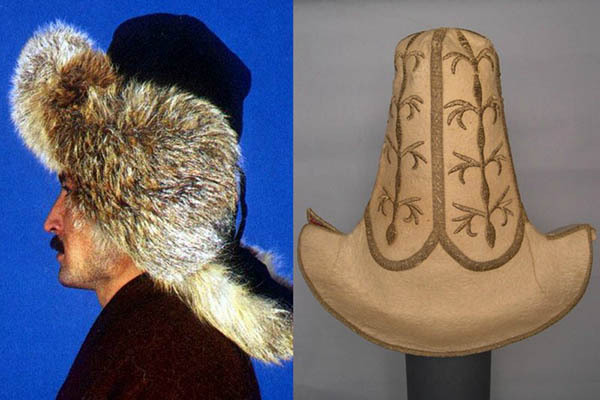 Kazakhstan Men are distinguished by their love of the bright cap with a luxurious appearance. 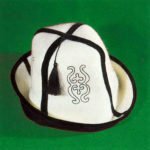 Regardless of social rank, men prefer the hat made of felt – “kalpak”.This headpiece is made to wear in the summer. A cap having a conical shape, made of felt white. The headpiece has high and narrowed the crown. Top tip “Kalpaka” is rounded or sharp. The crown caps, according to ethnographers, cross-linking of two identical halves. Representatives of more affluent classes were “kalpak” features more grandeur. 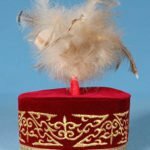 It was called a cap for the rich aristocracy and nobility “ayyr kalpak”. Headgear was shaped like a cone, the field is curled up. The inside of the cap is decorated with the help of thick fabric or felt. The outer side of the headdress decorated with the help of satin, velvet and floral patterns made using gold thread. 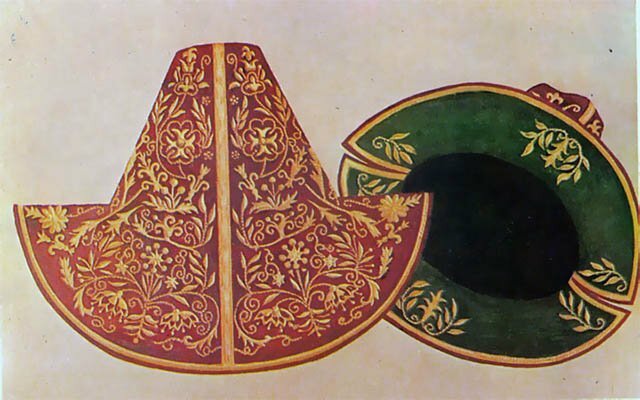 In the “Borik” was used as the main summer headgear. Hat was shaped like a perfect circle with a small edge, made of natural fur. 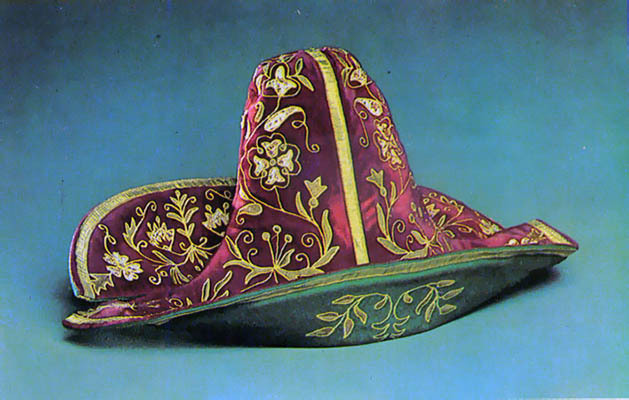 In some cases, a summer hat decorated using velvet. 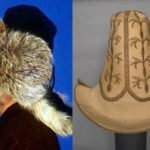 During the onset of the cold season Kazakh men dressed warm enough headdress called “tymak”, which was made from the wool of sheep.Children used the cap, which were made of fox fur. ” Takiyeh ” – summer option ” Borika “. 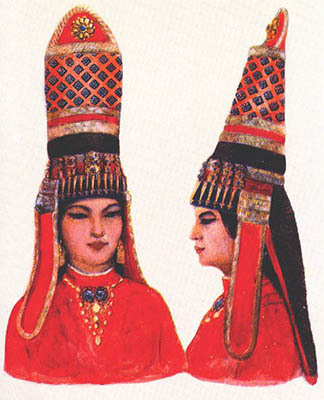 Classical female “takiya” was the most popular among girls headdress. As a rule, skullcap was circular in shape, differing little weight. The average height of a cap does not exceed fifteen centimeters. The upper part of the “takii” decorated with white feather owl, and on both sides of the headgear applied a variety of jewelry made of precious or semi-precious stones. Winter “Borik” was very similar to the traditional men’s winter headgear. 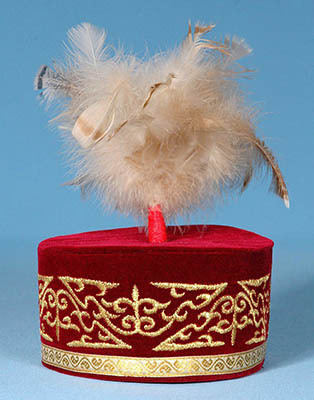 The only thing that distinguished the male and female caps, is a method of attaching fur band. In the ladies’ hat he was always on the outside and never turned away. 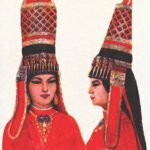 These hats girls had to wear until the formal marriage. On the day of the wedding, they went through a special ritual of farewell to childhood.